Chessboard diagram with algebraic notation, generally used for printing or computer displays. On physical boards with notation, a set of letters/numbers typically face each player. 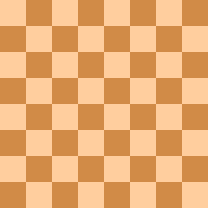 A chessboard is the type of checkerboard used in the classic board game chess, and consists of 64 squares (eight rows and eight columns) and 32 pieces.The squares are arranged in two alternating colors (light and dark). Wooden boards may use naturally light and dark brown woods, while plastic and vinyl boards often use brown or green for the dark squares and shades such as buff or cream for the light squares. Materials vary widely; while wooden boards are generally used in high-level games; vinyl, plastic, and cardboard are common for low-level and informal play. Decorative glass and marble boards are available but not usually accepted for sanctioned games. Each square on the board has a name from a1 to h8. In older English commentary, the files are labeled by the piece originally occupying its first rank (e.g. 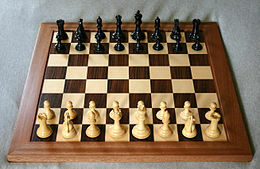 queen, king's rook, queen's bishop), and ranks by the numbers 1 to 8 from each player's point of view, depending on the move being described. This is called descriptive chess notation and is no longer commonly used.